The Italian philosopher and militant Antonio Negri has been a provocative and controversial figure for over forty years. He has been a professor of law at the University of Padua, a labor organizer in the Veneto, a political prisoner in Rome, a member of Italian parliament, a political refugee in Paris and most recently, as a consequence of the success of his book Empire (written in collaboration with American Michael Hardt), an internationally influential theorist of globalization. He has written over forty other books, which have been translated into dozens of languages, and his work has challenged orthodoxy in intellectual history, political science, labor relations, theology, and literary and cultural studies. 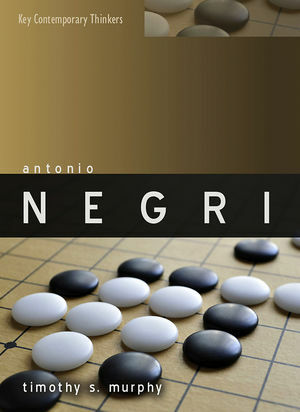 This book is the first comprehensive study of Negri's work in any language. It follows the development of Negri's critical framework and theoretical innovations from his early work as a historian of legal philosophy in the Fifties, through his period of intense and unconventional leftist activism during the Sixties and Seventies and his imprisonment and exile during the Eighties and Nineties, culminating in a clear, thorough and evenhanded account of his important contributions to the emerging study of - and struggle over - globalization. The book also includes discussions of Negri's critics and the reception of his work at each stage. Timothy S. Murphy is the Houston-Truax-Wentz Professor at Oklahoma State University. Chapter One: Who Is Toni Negri, and Why Are They Saying Such Terrible Things About Him? "Murphy's book provides a thorough and thoughtful engagement with Negri's work, covering everything from the early works on Hegel and Kant to the recent political debates on Empire. Besides covering works that have yet to be translated into English, its principal strength is the way in which it synthesizes politics and philosophy, demonstrating how Negri engages politics through philosophy and vice versa. It is no exaggeration to say that this book will fundamentally change the debate on Negri's work." "Sympathetic but not uncritical, carefully exploring the interplay of text and context, Tim Murphy's book promises to become the standard introduction to this exciting and controversial thinker." "Murphy's book is remarkable, at once an overview of Negri's work while also providing a detailed analysis of its mainsprings. There has been nothing like this book, written in English of course, but with a mastery of the Italian source material, and with an ear deeply attuned to the thought of a truly great and creative Marxist thinker."